I figure after the busy long holiday weekend what we all need is a day off... or maybe a night out! Why not just push all the hustle and bustle out of our minds for a bit... and let's all have a date night with our good pals Tim Drake (shhh!) Robin and Spoiler. I mean, what could possibly go wrong? We open during a... very starry... Gotham night. Robin and Spoiler are about to begin their first official date. Like a "date" date. To start, Robin takes her to the highest point in Gotham City... after the Earthquake... Wayne Tower. I just love how even with this little bit, Dixon includes a reference to the post-Cataclysm/pre-No Man's Land Batbook narrative. It isn't necessary... but it's just so awesome that it's here. They sit up there awhile trying to figure out a way in which they could conspicuously "have a date" while at the same time not tipping Stephanie Brown off to Robin' secret identity. Yeah... Tim knows Spoiler is Steph... but Steph only knows the "Boy Worrier" as Robin. Spoiler suggests they head to a theater catering to cosplayers for a sci-fi movie night. As luck would have it, none of the other patrons recognize either vigilante... okay, I'm enjoying this so much I'll let that slide... but really and truly... that's kinda bunk. Here Spoiler lifts her mask up a bit... Tim believes it's so she can have some popcorn... but instead she plants one on Tim's naive li'l lips. We shift scenes to an interrogation room. Steven "Shotgun" Smith is among the officers waiting outside the room while a gang is conferring with their lawyer. What nobody is prepared for is that lawyer viciously beating each and every gang member to death on the other side of the wall. Back with the kids... Robin and Spoiler decide to "give pizza a chance" and grab a late night slice. Here Spoiler removes her mask entirely... which struck me as odd... I'd forgotten about her doing that. The pair discuss their prospective relationship... Robin feels pangs of guilt that he cannot be more open with her whereas he knows everything he needs to about her. After finishing their meal, they decide against calling it a night... there's still more fun to be had. Back at the station, the gang massacre is discovered. We immediately jump to the "lawyer" who is revealed to be the martial artist Dragoncat... who when he "kills 'em they stay dead." There's a great comic book motto. He confers with Cluemaster. Speaking of whom, we also get a brief vignette of Shotgun visiting a young man in the hospital... and learn that the mastermind for the current rash of violence might be the very same Cluemaster. We rejoin Robin and Spoiler as they swing through the Gotham night. They wind up sitting atop a building where they have a cute exchange. Spoiler ponders if it's weird that she has to call him "Robin" rather than by a "real name". He laughs and reasons that at least Robin is a real name... he goes on to joke about how difficult it would have been if he'd gone by Nightwing, Green Lantern, or Aquaman. It's getting late, and Robin and Spoiler are winding down their night. They do the whole "it feels like we're the only people in the world" thing that most young couples do... and again, I'm enjoying this so much I'll allow the cliche. They part company, but promise to do it again real soon. We wrap up our issue one week later. Tim visits Spoiler at her home, as she did not make it to the playground. 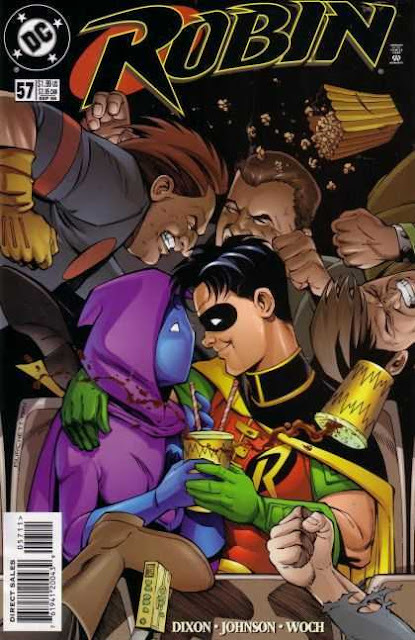 She says she felt too weak to go... Robin figures she might have the flu or maybe she's on her period... oh but, not so Boy Wonder... for, your Stephanie Brown... is pregnant! Such a fun little issue... I really miss these little "night off" stories. I mean we still get them every now and again... but, there's just something missing these days. Namely, history. Issues like this and the (in some circles) legendary Birds of Prey #8 really helped ground these larger than life characters... made them feel not only real, but relatable. It's not lost on me that both of these issues were written by the great Chuck Dixon. Really wish he and DC would bury the hatchet and get back to doing some incredible Bat-Family comics. This is one of those issues that it is weird to pull from at random... as we have two very different stories going on here. We have the Robin/Spoiler date night... which is amazing... and we get a scene in the interrogation room at the Gotham City Police Department... which, when taken out of context, is not. It's not bad... not at all... but putting this issue in a vacuum like we are here today, really makes it seem weak. I gotta say, I wasn't prepared for the surprise ending... even though I already knew what was coming. That's another strength in Dixon's writing... or perhaps an indictment on my memory... but we "zig" for so long, and so strongly... that when we finally "zag", it means something... and blows you away. All throughout the Robin and Spoiler "relationship", she had, in passing, mentioned an old boyfriend... it was organic "teenagery" talk... nothing that would really stand out. Love that it pays off in this way. Overall... great issue... lots of fun. Staz Johnson's art here is great. I find his work pretty underrated. He had the misfortune of following Mike Wieringo on this title... which I would imagine could give a guy a sort of inferiority complex (internal and external). The entire Dixon run here is a blast... almost comics "candy". Definitely worth checking out. Luckily this issue and the entire volume are available DC Digitally. Tim Drake is one of my favorite characters, and this was early in my lengthy run actually keeping up with the title--I got back in around #45 or so and followed til One Year Later. Filled the gaps, bought a set, and if I ever get my collection properly sorted, I'm confident I have at least 2 sets of 1-100, and most of two sets of 1-150ish.